See Tanya’s TV interview as Book Proposal Mentor, when she talks about helping aspiring writers develop, write and get their non-fiction books published. 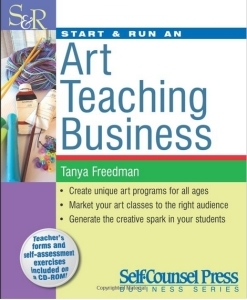 Start and Run An Art Teaching Business Book – Published by Self-Counsel Press. As Gloria Silk, Tanya Freedman has written two heady intercultural romances which are garnering great reviews. Go to www.GloriaSilk.com for full details of these books and her upcoming new ones. “Second Destiny” is phenomenal!” J Summers. “Gloria Silk has written a wonderful tale about cultural differences, the need for love and freedom after a life of doing and being what is expected of you. This is no cut and dried romance story; it is much more than that…” Natasha Jackson for Readers’ Favorite. What if you and your first love get your happy-ever-after, but it doesn’t work out? This story follows a beautiful, frustrated wife and artist who is reunited with the gorgeous hero with Bollywood-good-looks and charisma. When fate brings them face to face again, can they put their past behind, or will their sizzling, intense passion reignite and endanger everything in its path? Lia Abraham gave up everything for her family and culture—art, autonomy and even self-worth. Worst of all was the sacrifice of Bollywood-gorgeous, idealistic Devraj Shah, when Lia caved in to pressure from both their families. She broke her first love’s heart by marrying the “right” Jewish man. Nineteen years later, minutes after Lia demands a divorce from her cheating husband, her world turns upside down again; Devraj is at her door. His nephew and Lia’s feisty teenage daughter are repeating history. They’re in love, but the now reserved, enigmatic Devraj is dead-set against the couple’s marriage plans. He is convinced Lia’s daughter will ultimately reject his nephew the way Lia had rejected Devraj. After years of feeling caged in a loveless marriage, Lia embraces her newly found freedom, and her resurgent passion for Devraj is irresistible. Once again, she surrenders to the true love of her life, but their affair re-ignites opposition from both families. Will Lia’s second chance at love again destroy her loved ones and her dreams? Torn once again between her love for Devraj, her family responsibilities and her need for true independence, will Lia choose duty over the desires of her heart? Second Destiny is the story of Lia and Devraj, two former sweethearts who were torn apart by duty and family obligations. Lia was expected to marry a nice Jewish man instead of the handsomely exotic Hindu named Devraj, and instead of fighting for their love she gave in to the wishes of her family. But decades later, Lia finds herself ending her marriage to the cheating “right man” when she finds out that her daughter is in love with a handsome Hindu man who happens to be the nephew of her jilted sweetheart Devraj. Gloria Silk does a wonderful job of presenting just how constrained Lia felt after putting aside her feelings and marrying someone whom her grandparents considered an acceptable choice, but never truly feeling happy or satisfied with her life. When Devraj shows up and is against the relationship, it is clear he fears his nephew’s heart will be broken just as his was nearly twenty years before. Second Destiny is at its heart a romance, but it is so much more than that. The cultural differences that many of us take for granted are right at the forefront of this story. Both families have problems with their loved one marrying someone from another culture and at times it borders on full-on racism, which makes it easier to root for Danielle and Sanjay and even Lia and Devraj. Gloria Silk has written a wonderful tale about cultural differences, the need for love and freedom after a life of doing and being what is expected of you. This is no cut and dried romance story; it is much more than that because the feelings that still exist may not be enough to give Lia and Devraj their happily ever after.